With a seared crust that is loaded with umami and a body that is packed with Southwestern herbs and spices, the Southwestern lamb burger is nearly impossible to beat. Although ground lamb is an unusual platform for a burger, I have yet to meet anyone who tried one of mine and who didn’t love it. 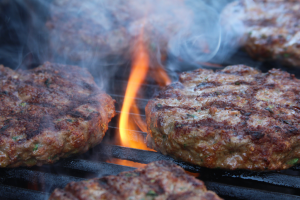 This burger is my favorite to grill because of the tremendous aroma that wafts up from the grill when the patty is first placed on a searing hot cast iron grill grate. The aroma is more intense and flavorful than plain ground beef. The lamb smells meatier somehow. If there is such thing as burger aromatherapy, this is it! Combine all ingredients except for ground lamb in a large bowl. Mix ingredients together. A rough mixture is fine for this purpose. Add the ground lamb in chunks and gently mix the lamb with the other ingredients. Do not overwork or compress the ground lamb. 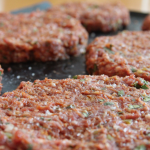 Compressing ground meat can result in a tough patty. Handle the lamb gently! Mix the ingredients so that everything is relatively well distributed. Perfect distribution of the ingredients is not the goal here, just a good mix. Form the patties on a plate. Press the meat just enough so that the patty does not fall apart. 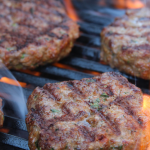 There is no need to make the patty concave as with beef patties because the lamb proteins will not shrink or tend to draw the patty inward during cooking. (That has been my experience when cooking them many times on gas and charcoal grills.) 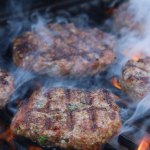 Make the patties in whatever thickness and diameter to suit your grill and application. I usually make about six patties that are slightly wider than the buns I am using. Grill the lamb burgers over medium high heat. 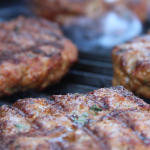 I usually close the grill cover and let them cook for five minutes on each side or until the patties feel firm enough to come off the grill. If you can get it, a fresh mint chiffonade makes a nice addition to the ground lamb and compliments the meat. Don’t be shy! Dress the lamb burger as you would any other burger. I like to use lettuce, heirloom tomatoes and red onions sliced to paper-thin thickness. Mayonnaise can provide extra moisture if your patties seem dry. Lesley serves the burgers with a Lemon Aioli but you will have to buy her book if you want that recipe. Serve with a glass of Rioja, Syrah, Grenache or Malbec. These wines pair wonderfully with grilled lamb. In my book, a good Rioja is the classic pairing for lamb. This entry was posted in Burgers, New Mexican Cuisine by Harold. Bookmark the permalink.